Since its original introduction in 1997, the Turf Tiger has been in a class by itself. There is no competition. Period. The Scag Turf Tiger can cover major grass with ground speeds up to 12mph (10.5mph on some models) and large, low-mounted fuel tank. The simple, trouble-free shaft drive cutter deck means minimum maintenance requirements and a wide range of cutting heights. The double tube steel main frame gives the mower incredible strength and durability. Folding ROPS, replaceable front caster extensions, flat free caster tires with tapered roller bearings, and Command Comfort Operator's Station are just a few of the MANY features the Turf Tiger offers. 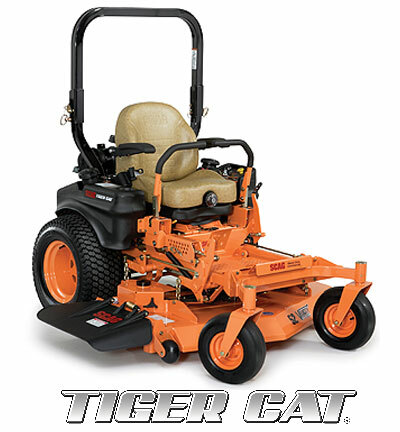 From the heavy-duty, Tri-Plate Velocity Plus cutter decks, to the various high-power, fuel efficient engine options like the fuel injected Kawasaki or Kohler EFI, diesel, propane, or massive 35hp Big Block models, there's a Tiger that will increase your productivity and send your competition running for cover! 52", 61" & 72" Velocity Decks. Up to 12MPH. The Scag Cheetah is the fastest and most comfortable cat in the Scag family. Clocking in at speeds up to 16 mph and featuring a coil-over shock suspension system, the Cheetah is truly a remarkable zero-turn mower. The Operator Suspension System isolates the operator platform via a coil-over shock and provides additional comfort via rubber iso-mounts. This innovative, adjustable system soaks up the bumps and keeps things simple with only three moving parts. Tri-Plate Velocity Plus side discharge cutter decks and the 61" Velocity Plus Rear Discharge Decks, to the various high-power engine options, there's a Cheetah that will increase your productivity and leave your competition in the dust! Available in 48 " / 52" cut and 61" / 72" cut. Small Cat, Big Productivity. With roaring power and agile maneuverability, the compact Scag Tiger Cat is a force all its own. Where productivity is essential, the Tiger Cat delivers with ease, capable of handling more than 24 acres per day. Powerful engines and a tough dual pump and wheel motor drive system ensure dependable performance, year after year. Equipped with a Velocity Plus cutter deck, this mower will tame the tallest grass and leave it looking smooth and professionally manicured. A full-body welded steel frame will not yield to tough terrain, while the low center-of-gravity keeps the Tiger Cat stable. The replaceable front caster extension protects the main frame against impact damage and features tapered roller bearings in the caster yoke pivots for long, dependable life. Comfort is maximized with either an adjustable suspension seat or a soft-ride seat. Adjustable steering levers, arm rests and a big foot platform reduce operator fatigue. 48", 52" & 61" Velocity Decks. Up to 10MPH . Reclaim Your Weekend! Are you tired of buying junk mowers that constantly need to be replaced or repaired? Would you rather spend your money on a quality, American made product that will perform and last like it should? If you answered yes to those questions, you have found the right mower brand, Scag. Give yourself the freedom to spend more time doing the things you really want to be doing like camping, fishing, spending time with your family and friends...the list goes on. The Freedom Z is designed for commercial and large estate use. We invite you to learn more about the outstanding, commercial grade features of the Freedom Z and how it can save you time while delivering professional results.48" Cutter Decks. Up to 8MPH.